The district of Murshidabad has its own beauty and charm. Though Baharampur is the district headquarters, the touristy and cultural attractions in this district, centre in and on Murshidabad town. 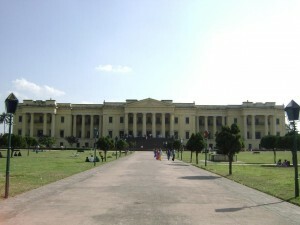 Once an important trading town, Murshidabad was the capital of Bengal Nawabs in 1705. Situated 219 km north of Kolkata, the town is still reminiscent of Bengal,s Nawabi heritage and grandeur. Murshidabad is also famous for its traditional handicrafts, especially silks, carvings and brassware. Air: The nearest airport is at Maldah, 124 km from Murshidabad. Rail: The district is connected directly by rail with Kolkata and other parts of the State. Road: The district is connected directly by road with Kolkata and other parts of the State. Ajimganj and Jaiganj: Noted for their Jain temples and palatial mansions of Rajasthani businessmen. Cossimbazar: A busy inland river port in the 18th and 19th century, the Cossimbazar Palace is also famous. Hazarduari: This “Palace with a thousand doors” was built in typical /gothic style in 1837. It now serves as a museum, housing a rare collection of old arms, curios, china and paintings. Jaffranganj Deorhi: Also known as “Traitor’s gate”, this was the mansion where the traitor Mir Jafar and his son Miran brutally murdered Nawab Siraj-ud-Daula, bringing about the advent of British rule in India. Kat Gola: The favourite garden-house of a rich Jain merchant in the 18th century, it has a collection of curios. Katra Mosque: Built by Murshid Quli Khan, the ruins of this mosque indicate the flowering of Muslim architecture of Bengal and its harmonization with the native style. Karna Subarna and gokarna: Excavation site containing unearthed stupas and viharas. Kunjaghat: The Maharaja Nanda Kumar’s palace here contains several valuable documents and records of his rule. Lalbagh: Lalbagh, in the district of Murshidabad was the abode of the last Nawabs of Bengal, the prominent attractions being Nimak Haram Deohri, Khushbagh, Hazarduari, Great Immambara, Moti Jheel, Katra Mosque, Medina Mosque and Wasif Manzil. Moti Jhil: Literally meaning “Pearl Lake”, this large ox-bowl lake guards a mosque and the palace of Ghasiti Begum, the daughter of Nawab Alivardi Khan. Palashi: Palashi is reminiscent of the Battle of Plassey in which Robert Clive defeated Nawab Siraj-ud-doula for the British Raj to take firm roots. A monuments marks; the victory of the British led by Robert Clive, over Siraj-ud-Daula, the then Nawab of Bengal. Baranagar: Baranagar is about 23 km away. The Jor Bangla temple built by Rani Bhavani in the 18th Century is the finest specimen of Bengal’s terracotta temples. About 1.6 km away is the ancient Shaivite Kiriteswari temple. This entry was posted in Murshidabad, West Bengal. Bookmark the permalink.